Imagine you never acquired another customer. Your sales team went home, and all you had left was your current group of customers. You’d probably spend a lot more time trying to retain them, right? Every customer that cancelled or didn’t repurchase would have a big impact on your business. That’s where customer retention comes in. The funny thing is, customers who churn have the same effect on your business even when you are still making sales. If your churn rate is 10%, you need to be acquiring even more customers to replace the ones that are leaving. It’s like trying to fill a bucket with holes in the bottom. Sure, you might be able to fill it, but it would sure be a lot easier if you didn’t lose so much water out the bottom! Patching the holes in your bucket is what customer retention is all about. Customer retention is the act of keeping customers engaged, creating customer advocates and reducing churn before it happens. To calculate your current monthly retention rate, take the number of customers you have at the end of the month, subtract the number you’ve acquired during the month and divide that by the number of customers you had at the start of the month. This calculation will give you the percentage of customers you’ve retained for the month. The higher the retention rate, the more customers you’re keeping around each month. 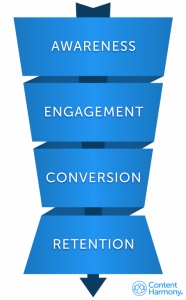 As you increase your retention rate, the “bucket” gets less leaky and your total customer base grows much faster! The benefits of a strong customer retention are enormous. Keeping customers engaged and happy means you’ll see more referrals and fewer cancellations. Bain and Co suggests even a 5% increase in customer retention can increase a company’s profitability by 75%. Any investment in customer retention programs pays off in the form of higher revenue and reduced customer acquisition costs. Great companies think long term when it comes to keeping customers around. SaaS and ecommerce has been around long enough that some companies now have customers for over a decade. Imagine signing up a customer 10 years ago and still being relevant and valuable to them today. The 10 year customer isn’t just a myth. By putting into place effective customer retention programs early, you can make sure customers would never think of walking out the door. Really happy customers are the secret sauce to long term success. And we’re going to help you delight them. If you’ve been tasked with increasing customer retention, boosting customer engagement or lowering churn, this post should provide inspiration on how to get started. You might find you’re already trying some of these. That’s great! We’re hoping we can get your brain juices flowing to help you find your next strategy to improve even further. Where possible we’ve provided examples and templates to make implementing these tactics quick and easy. Many tactics are backed up with research and studies that you can take to your boss if they need convincing. I recommend saving your top ideas to a Trello board or project management software so that you can track progress on them. Many of these are also great projects to delegate to newer team members looking for their first project to dig into! A focus on customer retention will pay off. 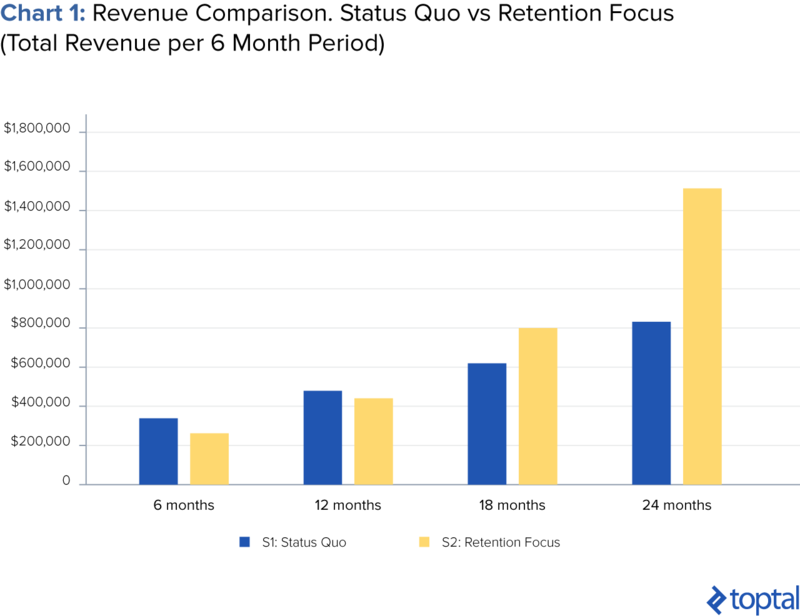 On average, companies who operate with a focus on customer retention increase revenue by 80% in a 24 month period. 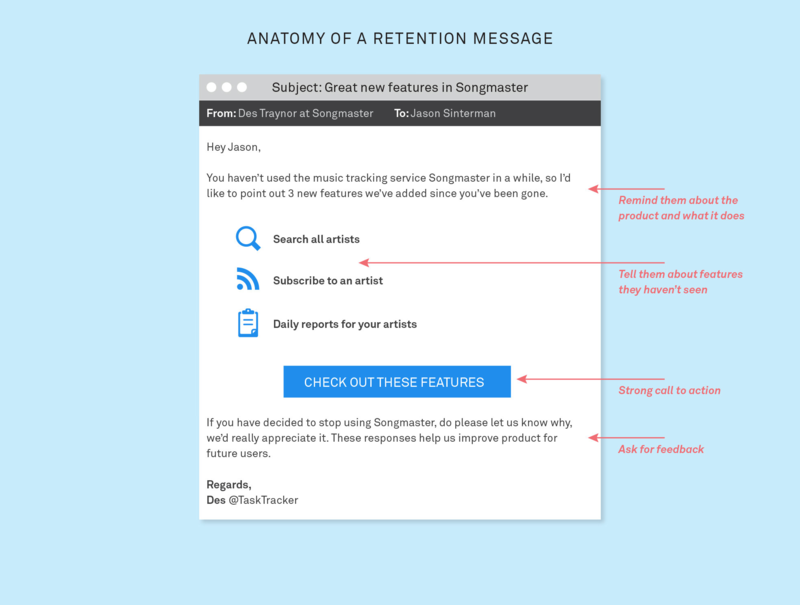 We’ve broken down the best customer retention ideas to 6 sections. Customer retention strategies need buy-in from every part of the business, and approaching the problem from multiple angles will drive even greater returns! Perhaps the first place to start is to understand why customers aren’t sticking around. When do customers become disenfranchised? What’s driving them to look for other alternatives? Implement your choice of strategies below to get a peek into your customer’s brains. What happens after your customer cancels? If you let them go silently into the night, you’re missing out on a big opportunity for clear, unfiltered feedback. Customers who have already left don’t have any reason to hold back – they will tell you exactly what went wrong. 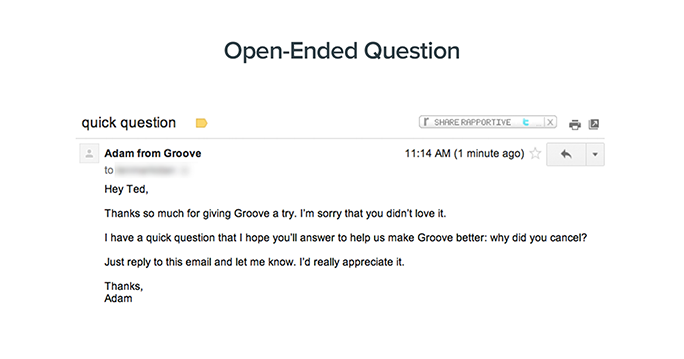 Groove started emailing customers who cancelled with an open-ended question. By keeping it open-ended they got specific, actionable feedback that they didn’t expect. Customers shared bugs that Groove didn’t know about, discussed UX hangups that Groove hadn’t caught and divulged use cases that Groove hadn’t considered. They received a 20% response rate from these emails. Baremetrics also automates a follow-up email to cancelled accounts. Notice they don’t try to win customers back or make excuses. It’s just a simple request for information about what didn’t work for them. Knowing what your customers are actually doing in-product can be a huge help in preventing churn and increasing usage. New technology improvements makes digging through all this data much more reasonable too. AI and machine learning are becoming more common in customer experience software, which means every company has the tools they need to crunch the numbers and find insights in their usage data. As Blake Morgan reports in HBR, companies deploying AI based software in customer experience are seeing promising results. While knowing your churn rate is a good first step, you’ll want to see what types of customers are churning and when. The way to discover this is through cohort analysis. A cohort is a group of customers who have similar characteristics. In SaaS, the most common cohort analysis is done based on time of signup. 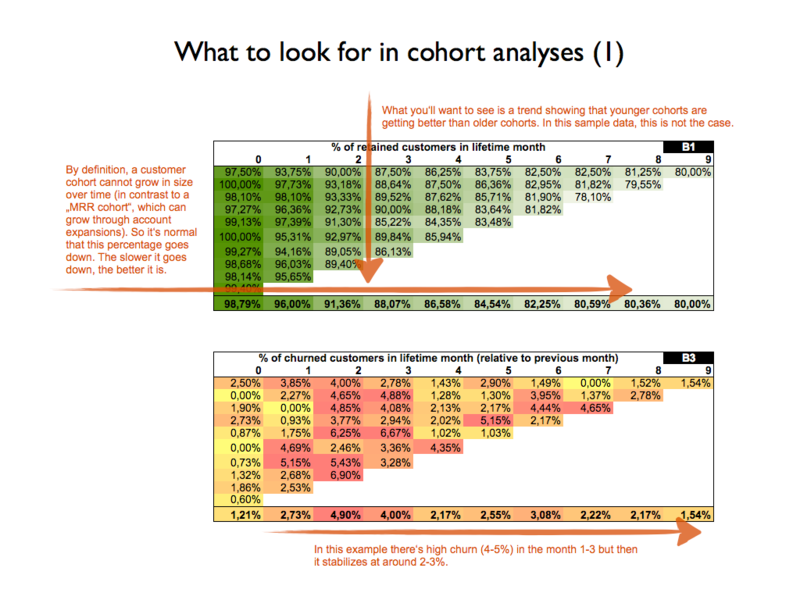 Christopher Janz has created a spreadsheet template for companies to start tracking churn by cohort. You can get it here. Ben McCormack, Hugger at FullStory, talks about the value of seeing customer’s actions on customer retention. You might know that customers have trouble getting started, but until you actually sit down and watch it through their eyes, it’s hard to feel their pain. Active, engaged users who are continually realizing value from your service don’t leave. Engaged customers are ones who interact with your company often – chatting on social, offering feedback, providing testimonials and referrals. Here are four strategies for boosting engagement with customers before they think about walking out the door. A recent study found that customers who have had social media interactions are less likely to churn. This was especially true in the case of “passive cancellations” where the customer simply drops off, rather than actively cancels their contract. Interacting with customers on social can be as easy as searching for mentions of your brand and responding or giving them a like. We also love Buffer’s examples of companies going above and beyond with social media engagement. We get the social media interactions started early by welcoming our new customers to Nicereply on Twitter. 1.2 billion people use Facebook to interact with brands. 37% of all tweets are customer service related. If you aren’t spending time talking to your customers on social, you can bet your competitors are! Because most of us spend our days in front of the computer, there’s a real benefit to engaging your customers offline. Jason Lemkin, founder of Echosign, has claimed never losing a customer he actually visited in person. While visiting every customer’s workplace might not be practical, anything you can do to make an offline connection helps forge a closer relationship with your customers. For example, attend industry conferences. Last year we attended SupConf in New York City and were able to meet with several of our customers while learning more about our industry. Conferences are a great opportunity to meet several customers in one area. While you’re travelling in a new city, look up customers who have offices there and invite them for coffee or dinner. They will be so pleased to have your undivided attention, while you get to learn more about your customers. Reviews, testimonials, and social media shares are all ways of engaging your customers through User Generated Content. It might seem like popular companies have tons of customers lined up providing reviews, sharing pictures on Instagram and recommending their service to friends. But that doesn’t happen organically. In order to get reviews, you have to ask for them. Wool and the Gang actively recruit content from customers. 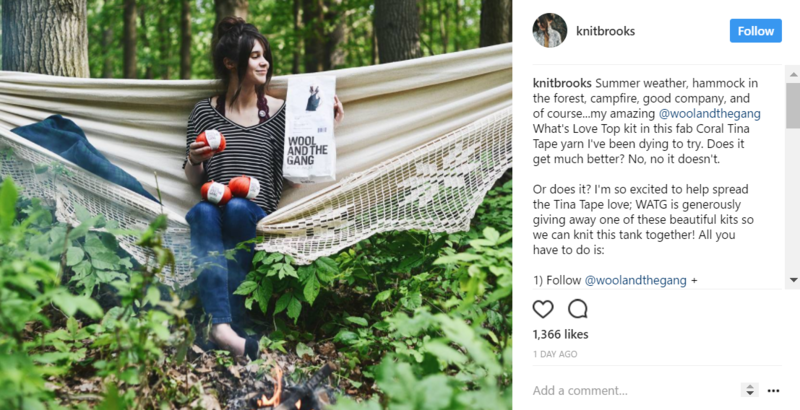 Every package comes with a suggestion to #shareyourknits on Instagram. The company keeps an eye on this hashtag and shares any pictures they like on their own page. Seeing other people enjoy the product is positive social proof – an effective psychological marketing technique! Social proof is a phenomenon where people base their own decisions on the actions and opinions of other people. It’s most effective when the proof is from someone the customer identifies with or aspires to be. For example, if you’re an aspiring professional snowboarder and your hero posts an instagram picture with a specific snowboard. You’ll likely have a better opinion of that brand because someone you admire has a good opinion of it. You don’t need to sell physical products to generate online content from your users. 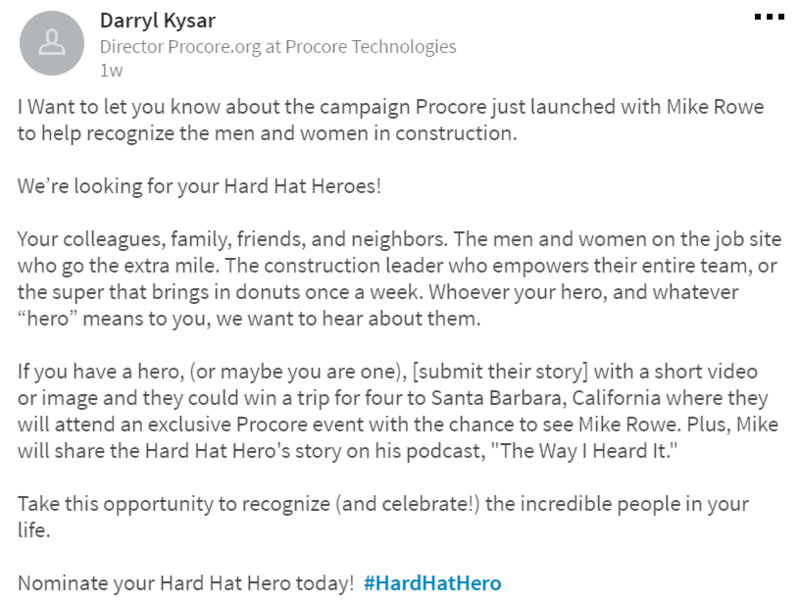 Procore (a construction software company) partnered with an influencer to showcase #hardhatheros. They recruited stories from customers that worked in the industry and showcased them on social media. Post purchase follow-up for reviews drives repeat business. Customers are twice as likely to make a repeat purchase if they leave a review (Hubspot, 2017). If customers leave a bad review, it’s a good customer service opportunity to intervene and set things right. Most people have their cell phones glued to their hands these days. This makes mobile marketing an extremely effective channel for retaining customers and driving engagement. SMS messages see a 98% open rate, while 90% of text messages are read within 3 minutes of receipt. How can you get started? Begin by making sure your site is ready for mobile users. If a customer lands on your homepage, are they able to navigate to what they need? Can they purchase or update information without needing to sit down at their desk? Secondly, think about ways you can connect with customers through their mobile phones. Push notifications are a great way to engage inactive users. Sending surveys or promotions through SMS (text messages) can get you much higher open and response rates. A huge part of retaining customers is delivering consistent, helpful customer service. Customers who experience bad service are far more likely to churn. 92% of customers say they make a decision to repurchase based on their call center experience. That’s a lot of potential revenue in the hands of customer support. And companies haven’t solved this problem yet. It’s estimated that failed customer retention, specifically due to poor customer service alone, costs UK businesses £12 billion each year! Imagine how much better customer service could get by investing that money back into front line teams. Customers are happy to pay more for great customer service too. In an American Express study, two-thirds of customers are willing to pay more to deal with a company known for great customer service. On average, they’d be willing to pay 13% more for great service. That’s a big markup on premium service! 42% of customers will quit doing business with you after just two bad experiences. That’s a ton of pressure on your front line team to not drop the ball. Instead of micromanaging every interaction, just hire people who genuinely care and they will do the job for you. Talented front line customer service staff can be tough to find. But we have a few tips on what you should look for. While product and technical knowledge can easily be taught, there’s certain customer service skills that you should look for in the hiring process. Problem solving – you want to find someone who will dig and find a good solution to every problem, even if they don’t have all the skills or information. Process improvement – the best customer service reps don’t just solve the problem for the customer in front of them. They make sure the next 10 customers don’t run into the same issue by solving for the root cause. Being able to think beyond what’s in front of them is a critical skills. Empathy – while it’s possible to improve empathy, it’s much easier to find agents who are naturally inclined to put themselves in the customer’s shoes. Attention to detail – if customers will only allow 2 bad experiences before they move to your competitors, you can’t drop the ball even a little bit. Finding an agent who will double-check their work and not let important information slip through the cracks will mean you retain more customers for the long haul. 96% of customers who have high-effort experiences report being disloyal in the future. A “high-effort experience” is anything that makes the customer feel like they have to work hard to get what they need. It might be a confusing UI or difficult customer service conversations. Reducing the effort customers spend doing business with you makes them more likely to remain customers in the future. To start measuring customer effort, you can use Customer Effort Score, a metric designed by CEB. It’s been found to be 2x more predictive of future customer behaviour than measuring NPS alone. When you’re choosing your customer service metrics, Customer Effort Score is great to consider in addition to NPS and CSAT. It’s transactional, actionable and helps find exactly where your customers are struggling to accomplish their goals. Occasionally, mistakes happen. When things go wrong, the best thing to do is to own it and apologize to customers affected. The Carey School of Business found that genuine apologies were the most effective form of service recovery. If a business says sorry on top of giving a credit, satisfaction with the interaction increased from 37% to 74%. 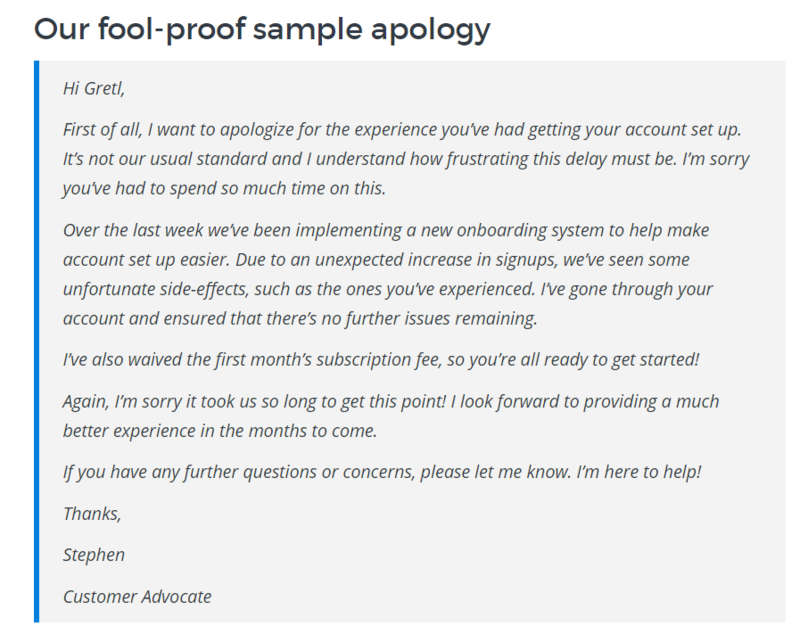 When you’re apologizing, make sure you understand the reason your customer is upset. Use clear language, empathize with the customer’s situation and explain what you’re going to do to fix it. We break down the perfect apology for customer service on our blog, where you can also find a sample apology to adapt for your needs. Having a thorough Knowledge Base is like having an always on, 24/7 support team. Customers are always able to help themselves. In fact, more and more customers prefer to search for the answer themselves rather than contacting support at all. Zendesk found that 91% of customers will willingly use help content if they know it’s available. Fewer customers needing live support means that your support team will be more available to provide high value support – such as proactive check-ins, personalized onboarding and educational programs. Plus, good help content improves the overall user experience. MailChimp’s user experience team includes a help content writer. Her job is to build trust in the product and increase product adoption by communicating the benefits and features of MailChimp in their documentation. Learn more about how MailChimp writes great help content on their blog. Customers who take the time to offer feedback are much more likely to be engaged, long term users. Passionate users have strong opinions about the direction of your product. That is, until you start ignoring them. If customer feedback goes into a black hole and nothing comes of it, it gives the impression that you don’t care about your customers. However, if you’re always asking for and incorporating feedback into your product, you’ll gain lifelong fans. The more often you seek feedback, the bigger this effect becomes. Your customers will feel involved and accountable for the success of their ideas. Suggestions and opinions will come through a variety of channels: customer support tickets, user interviews, sales processes. The first thing to do is have a set process for collating, reviewing and processing this information. If you’re able to keep track of feedback, you can easily see your most requested features and take that into account in your product roadmap. Feedback methods can either be public or completely private. 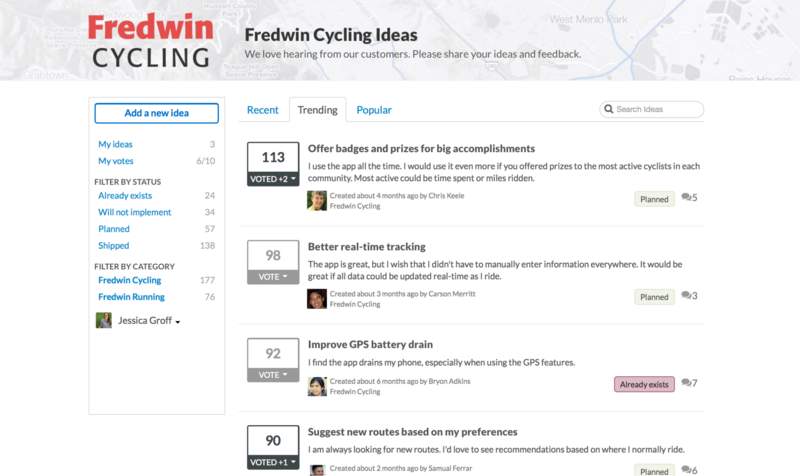 A public customer feedback board allows you to crowdsource ideas, and let customers vote for their favorite features. Transparency in feature requests allows the product team to respond publicly, and perhaps prevent customers from contacting support in the first place to ask about it! Popular options for managing public feedback forums include Aha! and UserVoice. It is important to set realistic expectations for customers using these forums however. Just because a feature made it to #1 on the popularity list doesn’t mean it will be implemented tomorrow. It might not be a good fit for the product, or be technically infeasible. What if all customers banded together and requested a free product? Monzo, a UK debit card company, does a really great job of explaining and showing their product roadmap to the community on a Trello board, where customers can vote for their favorites. Whether or not you decide to offer a public view of your roadmap and feedback forum, you should still have a separate method for collating feedback internally. This allows you to score feedback based on different factors – such as the value of accounts requesting it, feasibility and company strategy. Customers want to know that the product is heading in the right direction. Even if your solution isn’t 100% perfect for them right now, they will be more willing to stick around if they know you’re working on it and engaging with customer feedback. Release notes can either be dry and functional, or celebratory and engaging. If you’re releasing new features, share them in a blog post highlighting use cases. Fixed a niggling bug? Celebrate on social. Appcues offers suggestions for six different channels to promote your release communications through on their blog. Doing more with your feature releases is key to keeping long term customers engaged. Feature releases will often bring back inactive customers to try new functionality and see what’s changed. If listening to customer feedback leads to changes in your product, customers will be really happy to hear about it. Sending personalized emails with product updates makes individual customers feel heard. Thanks so much for filling out our survey in January. Your feedback was instrumental in the changes we’ve just implemented in our reporting section. Check it out now, and let us know if we’ve hit the nail on the head – or if we still have work to do. Customers who have had their ideas implemented will be more likely to use the new feature, recommend it to others and to stay engaged in the feedback process in the future. Gathering feedback from customers can happen in many ways. Running an effective NPS program will keep you up to date on how your customers feel about you while providing actionable insights into opportunities for improvement. NPS is more predictive of future customer loyalty than traditional customer satisfaction surveys. This means focusing on moving detractors (customers who reply with a 6 or lower) to promoters (customers who reply with a 9 or higher) will have a measurable effect on your average customer lifetime value and your churn rate. We’ve put together a list of the 30 best resources on NPS so you can learn more about implementing the survey at your own company. Imagine (maybe it’s not that hard) that you were dating someone and they spent a lot of time and effort wooing you, and then stopped the moment you were married. You probably wouldn’t be very happy, would you? Your customers are the same. If you drop all the charm the moment they sign the contract or click Purchase, you won’t see them coming back for more. Keep up the romance with these strategies for creating moments of delight in your customer relationships. If you sell a physical product, how much attention goes into the packaging? It’s one of the first impressions the product makes on your customers. Is it easy to open? Does it show off the product well? Is it wasteful? 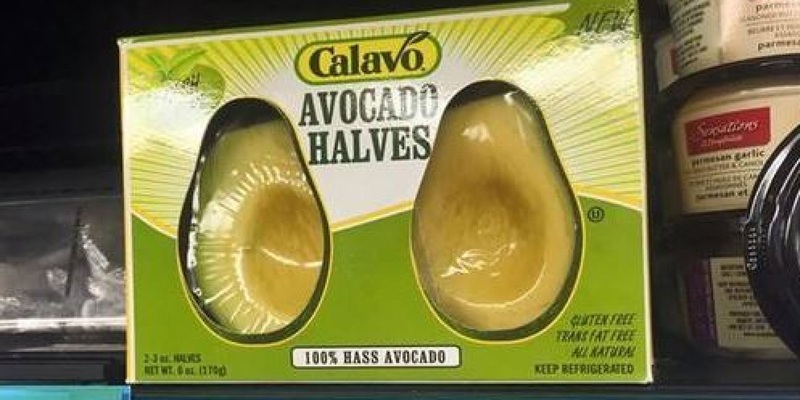 These over packaged avocado halves don’t do any of the above – most people would just think it’s excessive and unnecessary. 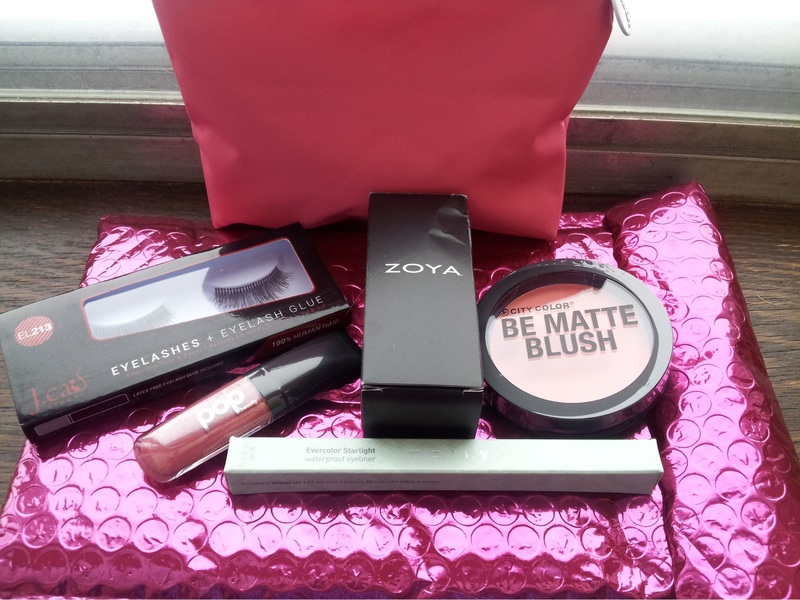 The beauty subscription company ipsy does an amazing job with the packaging for their monthly deliveries. It’s wrapped in bright sparkly purple, and the samples come with a little “glam bag” that can be reused for anything from a coin wallet to storing stationery. Taking the time to develop nice packaging for your products can provide a little extra delight for your customers – and make them even more excited about their next order! Studies show that while humans like nice things, they like them even more if they aren’t expecting them. This is called “surprise reciprocity”. While most people would expect a nice gift when something goes wrong, you’ll get much more mileage from swag if it’s sent “just because”. Although, even though it might seem like “just because” to your customer, doesn’t mean it needs to be random to you. You might choose high value customers, or ones that have recently undergone a staffing change. Perhaps you’re about to announce a new feature, so you want to make sure customers are engaged and paying attention. Here’s two articles to read to start thinking about how you can use surprise reciprocity to delight users when they are least expecting it. Mobile phone companies are notorious for treating new customers better than their existing customers. They entice them with discounts and freebies that leave current customer wondering, “What about me?” Rather than rewarding customers for switching, reward them for staying! 80% of your future revenue will come from just 20% of your existing customers. These are the VIPs you should be rewarding. They understand what your product is all about, and find it useful. They are your biggest advocates! Loyalty programs are becoming more popular and easier to deploy. 57% of marketers are planning to increase spending on customer loyalty programs in 2017. These programs return more than their fair share though. On average, customers who engage in loyalty programs generate between 12 and 18 percent more revenue than non-members. To get started, start simply. The easier it is for customers to sign up and understand the program, the more buy-in you get. Plus, as Smile points out, starting simply allows you to do a new marketing push for each addition to the program and also get customer feedback as you grow. This means they touch a lot of what customers see – product direction, onboarding strategy and marketing emails can all come from your product marketing function. Here’s four ways to leverage product marketing team to improve customer retention. I’ve always hated the image of a “sticky” product, but it’s an excellent metaphor. A sticky product is one that your customers would hate to live without, and would be difficult to leave. Sticky product usually offer value that stops the moment the customer cancels. That might be access to analytics, tons of integrations with platforms they already use or benefits that increase with the time used. To measure whether your product is sticky now, there’s a simple test you can ask your customers. Sean Ellis designed this product/market fit survey to determine how your customers would feel if they lost access to your product in the near future. Could they go on without it? If 40% or more customers answer “very disappointed” you’re doing pretty well! If customers wouldn’t be disappointed to lose you, it’s time to start building more stickiness into your product. How many emails do you send to your customers? Probably quite a few. One when they sign up, one for their first order, maybe one each billing cycle. Do you send them one when they start showing signs of inactivity? Emails can help deliver information, but they can also help maintain your crucial customer relationships. There’s two main types of emails you’re probably sending your customers; transactional emails, and marketing emails. Transactional emails are based on an interaction, or something happening. These are your billing emails, your notifications and daily digests. Marketing emails are strategically written and timed in order to convince your customers (or leads) to do something. Need inspiration? Baremetrics has published their entire library of the 17 messages they send for customer engagement. Intercom’s messages are designed for in app messaging, but can definitely adapted to emails as well. A first impression matters more than you think. According to Preact (a SaaS metrics company recently acquired by Spotify) 23% of churn is due to poor onboarding. And this makes total sense. If you’re trying out a new service, you sign in, play around and then make your decision on whether to keep investing time in it. If you don’t immediately see the value in the product, you’re unlikely to continue using it. To retain customers past onboarding, you need to set them up for success early on. Find your Aha! Moment. This is the part of the journey that customers “get it” and can see exactly what benefit they will get if they keep using your product. Mix up your content. Use videos, in-app messages, emails and webinars to get the message across. Focus on the benefits, not the steps. Rather than telling the customer what to do, show them why they should do it. Magoosh, an online prep test company A/B tested a welcome message for new students. They increased conversions by 17% by providing clear options right from the beginning. Improving your onboarding doesn’t have to be a super involved project either. There’s so many onboarding tools available (here’s 15!) that help you create, deliver and personalize onboarding content for your new customers. Most of them don’t require development team resources to get started. If you need inspiration, or just a laugh, we highly recommend clicking through Samuel Hulick’s User Onboard teardowns. Another great tool is Userlane. It’s a customer onboarding automation and retention platform designed to increase activation and engagement and boost conversion rates using interactive performance support. An exceptional customer experience is key to customer retention, and Userlane guarantees its end users an outstanding user experience. Userlane also offers a free customer success program with each plan. Content is frequently focused on the top of the sales funnel. Marketing teams invest heavily in the awareness, consideration and decision stages of the buyer’s journey. This is great for getting customers to close the deal. But if your content strategy doesn’t include retention, you’ll be losing customers just as fast as you’re acquiring them. Plus, you’re missing a huge revenue opportunity from driving upsells and referrals. Content designed for customer retention is about helping your customers get as much value out of your product as possible. Educational guides, webinars and deep dives into industry news are all as important to retention as they are to acquisition. In order to build in retention to your strategy, Content Harmony recommends thinking of your sales “funnel” as an “hourglass” by adding retention as a dedicated stage after conversion. Then, plan your content schedule ahead of time to make sure your editorial calendar is showing love to every stage – including existing customers. Retention content works really well when developed as a collaboration between support and marketing. Improving customer retention is an ongoing battle. Preventing cancellations doesn’t start when the customer is on the phone with you asking to cancel. It starts before they even sign up and continues through onboarding and beyond. Customer retention involves every part of the business. Understand why your customers are leaving, and where your biggest areas of opportunity are. Put in systems to measure customer engagement and product usage early. Invest in great customer service for when things go wrong. Hire great people who will do the right thing even when you’re not watching. Ask customers what you can do better and then listen to what they say. Use proven systems to track and measure customer feedback to understand how you’re doing. Look for opportunities to delight customers and build even stronger relationships. Even little moments of delight improve the perception of your brand. 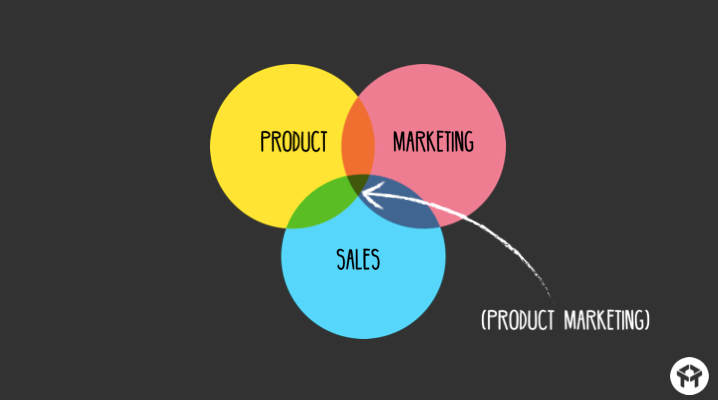 Lean on product marketing to onboard customers properly, position new releases and market to existing customers at every stage of the lifecycle. Don’t wait until it’s too late and customers are running out the door. Start building a sustainable customer retention program now.